Spring is in full effect now and I simply cannot get enough of all the trees, flowers, greenery, etc! 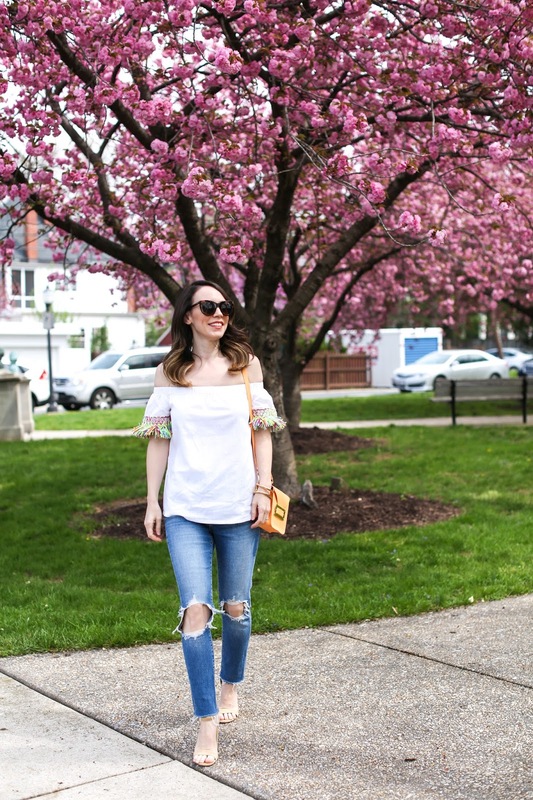 This top felt especially festive for all the new blooms that are out now, even though it will transition perfectly into summer with some cut-offs and flats. Even though I want to wear so much color for the warmer weather, I have been on a neutral shoe kick lately. I am drawn to sandals in varying shades of tan, beige, brown or white and find them so much easier to pair with outfits than a specific color. These Steve Madden ones I bought last year are one of my favorites to wear mainly because of the simple shape and color which make them suitable for almost any look. I thought I would pull together some of my favorite neutral sandal styles from around the web which vary from casual and low-key to something for a more dressy evening out. Scroll through the widget below for all my picks (click on the arrow to the right of the widget to see more options).